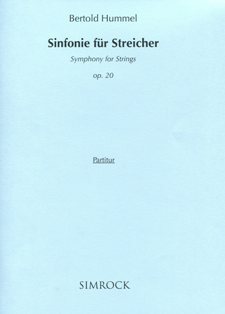 In my Symphony for Strings in two movements, I do not in any way attempt to do without established symphonic gestures. No polarised thematic material is presented, however; instead, motifs extracted from a six-tone cell are subjected to constant modification of rhythm and figuration. There is a sharp contrast between the expressive Andante Maestoso in written-out rubato manner, arrested at its climax by a generously proportioned cadenza for the solo violoncello - to which the muted tutti provide a counterpoint - and the Vivace movement drawing its energy from motor-like impulses. In this process, completely new aspects of the motifs developed in the first movement come to light. A march-like passage is inserted - in multiple canon technique - and leads into a whirling final section which condenses the various elements of the symphony. Bertold Hummel's "Symphony for Strings" was written in 1959, when the composer was in his 43rd year. If one follows his creative development carefully, a slow but constant progression is observable. That does not mean that he has not written much: in this point, Hummel shares Max Reger's view that the composer should "write himself free". In the course of many works - his oeuvre includes music of all genres - a style has developed which, by the 1970s at the latest, had congealed to show an unmistakable signature. I emphasise: no German composer of his generation, not even Henze, has developed a style which is immediately recognisable as characteristic after the first bars. In the field of modern music, this can otherwise only be said of the aged Messiaen. Keys works of Hummel's in this regard were for example the 2nd Symphony (1966), the ballet "The Last Flower" (1975) and then the masterworks of recent years: "Visions" for orchestra and the "Concerto for Percussion and Orchestra". An important work form the earlier phase is then the "Symphony for Strings", which you hear today. Many seeds of his mature style are to be found in this piece, even though we can occasionally salute some of his models, such as Bartok in the virtuoso revolving figures of the second movement or Genzmer as well, under whom Hummel studied. In compensation, this piece offers a remarkable - almost still youthful - freshness, a virtue which one seldom encounters amongst other German composers of the 50s and 60s. Particularly worth noting is the two-movement construction: the Espressivo with its powerful gestures is followed by Ludus, the game. It is for example a great moment when the events of the first movement are abruptly halted, leaving a pedal-point E in the basses, above which a long cello solo opens, answered by violins and violas con sordino: these then unite with the cello and begin to build to a climax; this is interrupted; the cello (Hummel is a cellist!) presents four bars of fantasy alone and is then extinguished in the low E. A relatively short coda closes the movement in a contemplative mood. The second movement with the central tone A is in the relation of a fifth (E - A) to the first. With a good portion of simple delight in playing, interrupted by blocks of dramatic material, this movement gives the players free rein and lends the whole symphony a classicist feel. Constants of Hummel's musical language as they already emerge in this work: eloquent declamatory gestures, a dramatic sense particularly in the formal structure, harmonic effects resulting from superposition of different building blocks and consequently linked to real mixtures and combinations, melodic ideas based preferably on twelve-tone fields and, in matters of rhythm, the frequent choice of ostinatos. The dense substance of this work, which was not only vitally expressive but also demonstrated a high degree of intellectuality, was distinguished by an esoteric seriousness - far from mere music for pleasure - and seemed in its construction to suit the orchestra. The change from delicate sensuality in sonority, sinewy fervour and linear tension (one was occasionally reminded of Samuel Barber) to crystalline fragility in the Andante maestoso was not without nobility. The same is true of the austere tracing of the bizzarreries of the Vivace. The whole was well wrought, had character and captivated the attentive listener.